Komfortrauschen continue to do what they know best. 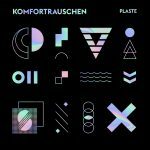 With their new album Plaste, they venture into a world of vivid, three-dimensional musical storytelling: Kafka on the Shore? Let’s take a closer look! They start off with a captivating precision. The first track Dorian is exact, pulsating like a machine. Arousing feelings of musical déjà-vu, we ask ourselves: wait, have I been here before? In the second track Hank we find the same precision. A hollow thumping noise is joined halfway through by something softer, more pounding, pushing its way through the soundscape. This musical layer gradually transforms itself into a funky upbeat sound that continues to weave its way through the piece. In the third track Massefhase the virtual world takes over completely and creates an insurmountable divide between ourselves and reality. We lose ourselves in the sound. The thumping turns into a friendly buzz. Clear influences from post-rock and blues come to the fore. We can almost grasp the heat flickering in the air. On the B-side we find the track Malo, which is much faster, restless even, driven. This time we hear Kafka on speed. Once we surrender to the music, we are taken to Jänna. A track absolutely and totally in tune with itself. It has exactly the right pace. Evoking the almost perfect ASMR experience with the music. Komfortrauschen fetishize sound like the stretching and brushing of something, appearing and getting lost again in the rhythm. Finishing with Le Stuff, Komfortrauschen take us right back into a weird twilight zone. What’s up with the stuff? What stuff? Not my stuff? Where is the stuff? Where is Kafka’s stuff? Who is Kafka? Kafka is dead, baby, Kafka is dead. A rocket launching pad inextricably tangled with an electric guitar, bass and drums. The cold wires, cables, pedals, beats fuse with living hands to come alive. Euphoric yet still sober, urgent and demanding yet sill relaxed and calm, contemplative and deep yet free and light – the appropriate soundtrack for meditative courtship behaviour in a bare concrete room. Always played live but with the aesthetics of a DJ set – that’s Komfortrauschen, a three piece live minimal techno band from Berlin. They shared Stages with: Jacob Korn (Uncanny Valley), Niklas Kraft aka Talski (Rivulet, DUR) and David Campesino. They already payed at: Katzensprung Festival (2017), Breminale (2017), Nachtsicht Festival (2017), Fusion Festival (2016), XJAZZ Berlin (2016), Lunatic Festival (2016), Festa do Jazz do Sao Luiz Lissabon (2016), XJAZZ Istanbul (2015), DAVE – Dresden Audio Visual Experience (2015), XJAZZ Berlin (2015), Torino Jazz Festival (2015), XJAZZ/Extreme Chill Festival Reykjavik (2015).